You can order yours too (pardon the shameless self-promotion. I need extra money! hehe) for only P400 in any color you like in sheer or jersey. Just leave me a comment with your email. Have A Nice Day! LIVE GREEN. absolutely love the colors...and the polka dots....LOVE!!! Great look and it looks good with the yellow background. Very good choice! Super cute! I love the colors!! Love those shorts! What a great color for spring! Oh, I can't tell you how much I love your blouse and short combination. Especially the color of the shorts. your ring is stunning ! love those outfit and definitely that 'love' ring! I want! This outfit is sooo fun!!! i love the color of your short! I love your polka dot top mixed with the green shorts! oh you look fabulous, right out of a vintage movie. This outfit is awesome!! I love the color!! Great ring. Oh I love how fresh and youthful this outfit is. The polka dot blouse is a breath of fresh air! This sounds redundant, but I love your LOVE ring! hihi :) cute shorts too..like the color! I'm sucker for polka dots. Like this outfit a lot. P.S Thanks for the comment. Love the colors! You pulled this off beautifully! cute shorts and tote! love the ring! I love this outfit! So colorful and flattering! Nice choices! you look so cute! great colors! love the shorts! nice color! Such a great outfit. Love the colors on you and that tote is awesome!! Hey Ms. Eggplant! first of all thank u for your lovely comment on my blog! This look is adorable, so colorful! I really like the bag! I lovveee this outfit. The colors are so cool and summer-ish, so candy-ish. Looks very good. 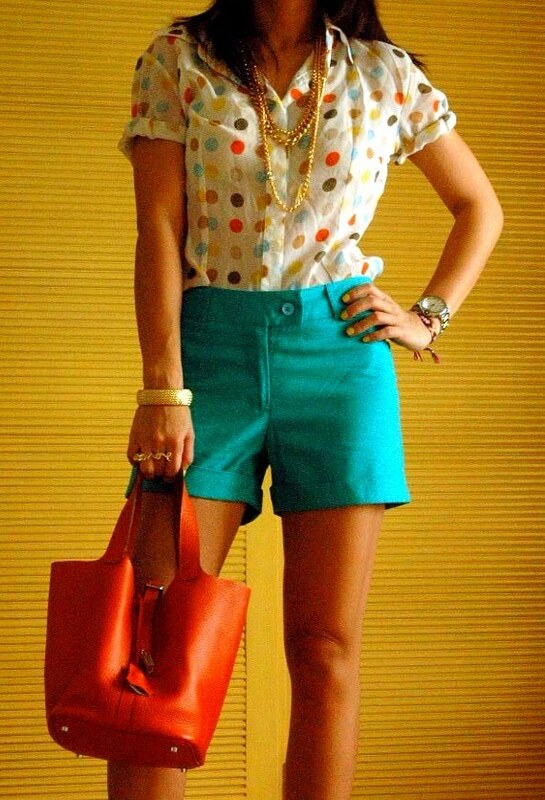 I absolutely LOVE those turquoise shorts and the combination of rainbow and polka dots is fabulous on the top! Where did you finds these things, that match so perfectly? Love the bag and shorts! Thanks for sharing the spread and drop by me too,soon. as for litas, i have the black ones, they go with everything! but at the same time i would love a fun color! i covet the shorts and top. OMGOMOMGOMG I LOVE THIS OUTFIT!! the bright polka dots on your blouse.. and the bright color of your shorts.. everything is so cute! Those shorts are amazing - the cut, the colour, just everything about them is killer! This outfit is so fun and fresh! I love that ring also. Thanks for your comment! Love that ring. So unique and makes such a wicked statement to your whole outfit and vibe. Thanks so much for your comment and visit.